Originally a locksmith used a forge or a mould to build his locks since every locksmith designed, “manufactured” and assembled his own locks from start to finished product. He would work in a forge or a workshop with a hearth used to heat metals. Metals were heated in order to be shaped by using tongs, an anvil and hammer. The metal would be heated enough so it would bend into the desired shape by hammering. Tongs would be used to hold the heated metal. The metals would be heated and then cooled in a tub of water so that they would harden into the desired shape. Tools of a locksmith today are considerably smaller and easier to handle. In fact, a locksmith can be mobile now since he does not require the use of fire and water. Generally, unless a locksmith is also an engineer, he does not have to design or manufacture any locks. Most repairs are made by swapping out broken parts with mass-produced new ones. He can replace a lock, drill out a lock or re-key a lock with minimal time and effort. Every locksmith possesses a lock pick set for opening locks without a key. These long narrow needle-like tools are inserted into a lock and catch the tumbler so that it can be set into its own unlocked position. The lock opens when all tumblers are set into their unlocked positions. Another method a locksmith uses to gain entry is to decode a lock. Using depth keys, a locksmith can code cut a new key that matches the pre-existing key or he can use an expensive code machine as well. 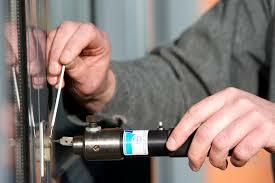 A locksmith can also cut new keys or duplicate old ones using a key-cutting machine. He will still use a file to smooth down the sharp edges of new keys; however, this file is considerably smaller than the one that early locksmiths used. A locksmith today will also install and maintain electronic security systems. These systems would include code keypads in which a sequence must be entered in before the door will open. Television and video recording systems would also be used in more sophisticated systems.